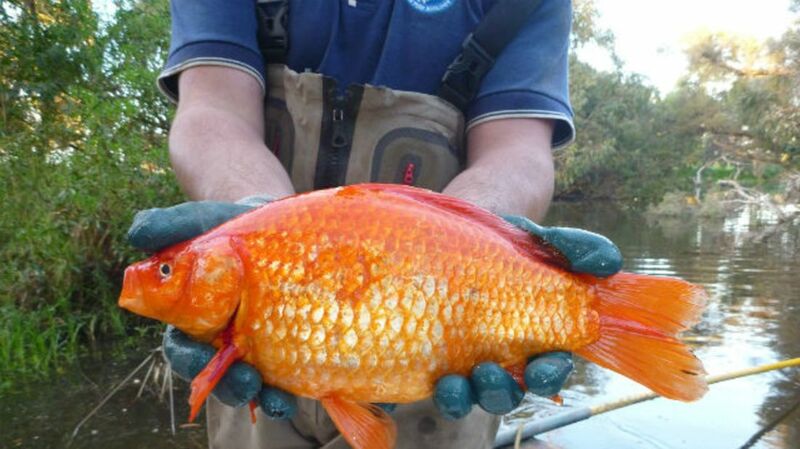 For decades, Australia’s Vasse River has been victimized by alien invaders: goldfish discarded from home aquariums that are growing large. Very large. How do they get so big? It might be better to wonder how they usually stay so small. According to National Geographic, goldfish are domesticated carp that were first imported into the U.S. in the 1850s. It’s not true that they remain as tiny as when they're first purchased: Given a proper protein-rich diet and warm water, they’ll pretty much keep growing. Keeping one in a bowl is never recommended, as it can lead to stunted growth and a lack of oxygen. If your fish is on the small side even with room to spread out, it might have been sold as “tank suitable,” which means it won’t get much larger than 10 inches. While these large fish are probably enjoying their comfortable new habitat, their presence is proving disruptive to the local ecosystem. Because the fish can travel as far as 142 miles, they’re winding up in bodies of water that suffer from their presence: Lower aquatic fauna and the spread of disease are two possible complications. Murdoch researchers are hoping further investigation into their travels will be able to pinpoint exactly where the fish are going so their numbers can be reduced before native species are affected. The moral? It’s never a good idea to release your unwanted fish in local waters. Try returning them to the pet store or find a place that specializes in gill-related rescues.